(Los Angeles, CA) - DENK gallery is pleased to announce Real and Unreal, the gallery's first solo exhibition of new photographic works by Los Angeles-based artist David DiMichele. Interested in the fabrication and staging of fictional spaces, DiMichele engages the ambiguity of the "in-between," creating images that attenuate disbelief through elaborate means of visual persuasion. 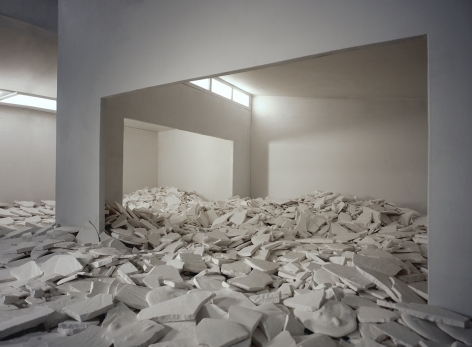 The artist's physical production of the imagined spaces and installation fantasies he depicts in his work grounds his unique practice in the materially substantial process of rendering. Working across mediums, DiMichele produces these staged sets with sculptural forms used in the context of installation. The work remains fundamentally ephemeral, however, in its presentation as a photograph. By combining both analog and digital processes to generate these imagined contexts, DiMichele conflates proposition and fact with an impressive degree of plausibility. DiMichele's large-format photographic works appear at first glance to be installation shots of ambitiously activated and curated gallery interiors, often wholly occupied and site-specifically transformed. Upon much closer inspection, however, these convincing facsimiles - so compelling in fact that they are often mistaken for the real thing - reveal themselves to be specious illusions. A complex representational device frames DiMichele's investigations into formal abstraction: a gallery model made to scale. By creating these miniaturized dioramas in his studio, the artist is freed from any prohibitive restrictions that might impede the realization of such projects in the real. Space, expense, physical logistics, nothing hinders the fulfillment of the idea, no matter how pragmatically unfeasible. The resulting prints from this series aptly titled pseudodocumentations, straddle a fine line between reality and fiction. As documents of simultaneously existing and incorporeal spaces, the works revel in an equivocation. This representational indeterminacy, so central to DiMichele's work, asserts something of our desire to believe in the unreliable "truth" of images. David DiMichele attended the University of California at Berkeley, completed a B.A. at the University of California at Santa Cruz, and an M.F.A at California State University Long Beach. He has had solo exhibitions in Los Angeles, New York, and San Francisco, and many group exhibitions in the U.S. and Europe. In 2008, DiMichele was awarded the prestigious City of Los Angeles (COLA) Individual Artist Fellowship. Recently, his work was featured in two major anthologies on contemporary art, Post Digital Artisans by Jonathan Openshaw (Frame Publishers) and Big Art, Small Art by Tristan Manco (Thames and Hudson). A monograph on his Pseudodocumentation works with an essay by Michael Duncan will be released in conjunction with the DENK exhibition. His works are included in several public collections, including The Hudson Bay Company Collection, New York, Dreamworks, Los Angeles, Bank of America Corporate Offices, Los Angeles, Disney Corporation, Burbank, The Capital Group, Los Angeles, and the Laguna Art Museum, Laguna, among many others.